All New Foal & Calf Feeding System - $49.00 ea. Creep Feeder II is an all new way to creep feed for horses and cattle. Made of high density plastic and stainless steel hardware it is made to withstand the mother's abuse. An adjustable sliding top lets the Creep Feeder II be adjusted as the baby grows. A removable bottom makes for easy cleaning and removal of uneaten feed. And the allen wrench which holds the bottom in place, is also used as the tool for adjusting the top. 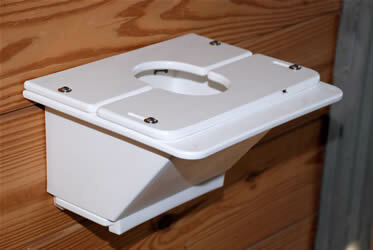 Creep feeder II was developed out of necessity, no other product like it! Whether you breed many or only one mare every year, this foal feeder holds up great to the abuse a mare can dish out. This foal feeder is designed to last years. It is also safe for foals and adjustable as they grow. It has the added feature of easily cleaning out any uneaten feed by having a removable bottom on the feeder. The Creep Feeder II is made of high density plastic and stainless steel hardware for a long lasting and easily cleanable feeder. Price is $49.00.